Young people receive pastoral care in the form of companionship, prayer and blessing. 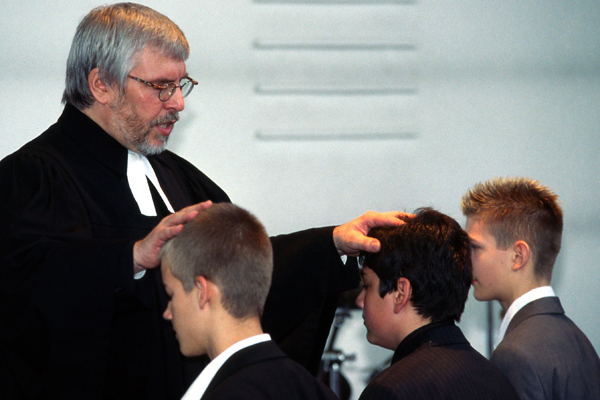 Confirmation normally takes place at the transition from childhood to adulthood. Admittedly there is no biblical instruction concerning this, and it is not regarded as a sacrament, but it is a feature of Protestant self-perception. Young people receive pastoral care in the form of companionship, prayer and blessing. They are given a personal confirmation motto or saying to emphasise this. Confirmation classes prepare the young people for their confirmation. They are familiarised with the central declarations of the Christian faith and with the life of the local church. The confirmation candidates are given an experience and an understanding of the church in all its variety through group work, visits or work placements, camps and holiday activities, with spiritual accompaniment on the way. As well as regular weekly meetings, many local congregations engage in other forms of confirmation work such as 14-day tuition, educational courses, weekends away, or block teaching on particular topics. This often involves volunteers, youth workers and parents, More information about the dates for registration for confirmation classes can be obtained from the minister or the parish office. Confirmation, which is carried out during a service of worship in the local church, gives an entitlement to personal participation in the communion service. In addition, those who have been confirmed are permitted to become godparents.